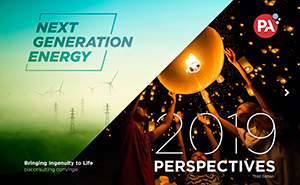 In this year’s Next Generation Energy 2019 Perspectives, we discuss the ongoing challenges of changing customer expectations, regulatory pressures and policy changes, technology advances and the need to increase operating efficiencies. We explore changes in digital for utilities, such as AI, analytics, and large-scale technological change. Our experts weigh in on where utilities can look for cost savings, and what to expect from emerging utility rate design. We consider the effects of climate change on utility reliability and resiliency, and how to delight utility customers with digital communication. We examine clean energy policy in the United States, renewable and emerging technologies, and the future of energy storage. Around the world, we discuss priorities for the UK electric and water sectors, offshore wind in Europe, and electricity market reform in Mexico. As we look ahead, we expect utilities to fully evolve into Next Generation Energy (NGE) companies operating in a complex environment, in a sector that is undergoing broad shifts and rapid transformation. The changes utilities are making now—and in the future—will not just consist of adding some new systems and technologies, but rather becoming less infrastructure-oriented in nature and more data- and customer-centric. With 2019 now underway, we hope this issue of Perspectives addresses issues and topics that are of interest to you and your team.